We build a social network from n people numbered 0, …, n − 1. Some pairs of people in the network will be friends. If person x becomes a friend of person y, then person y also becomes a friend of person x.
IAmYourFriend makes person i a friend of the host only. MyFriendsAreYourFriends makes person i a friend of each person, who is a friend of the host at this moment. Note that this protocol does not make person i a friend of the host. WeAreYourFriends makes person i a friend of the host, and also a friend of each person, who is a friend of the host at this moment. After we build the network we would like to pick a sample for a survey, that is, choose a group of people from the network. Since friends usually have similar interests, the sample should not include any pair of people who are friends with each other. Each person has a survey confidence, expressed as a positive integer, and we would like to find a sample with the maximum total confidence. Initially the network contains only person 0. The host of stage 1 (person 0) invites the new person 1 through the IAmYourFriend protocol, hence they become friends. The host of stage 2 (person 0 again) invites person 2 by MyFriendsAreYourFriends, which makes person 1 (the only friend of the host) the only friend of person 2. The host of stage 3 (person 1) adds person 3 through WeAreYourFriends, which makes person 3 a friend of person 1 (the host) and people 0 and 2 (the friends of the host). Stages 4 and 5 are also shown in the table above. 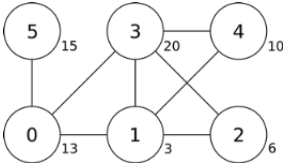 The final network is shown in the following figure, in which the numbers inside the circles show the labels of people, and the numbers next to the circles show the survey confidence. The sample consisting of people 3 and 5 has totalsurvey confidence equal to 20 + 15 = 35, which is the maximum possible total confidence. Given the description of each stage and the confidence value of each person, find a sample with the maximum total confidence. Line 3: host, protocol, host, protocol, …, host[n-1], protocol[n-1]. confidence: array of length n; confidence[i] gives the confidence value of person i.
host: array of length n; host[i] gives the host of stage i.
protocol: array of length n; protocol[i] gives the protocol code used in stage i (0 < i < n): 0 for IAmYourFriend, 1 for MyFriendsAreYourFriends, and 2 for WeAreYourFriends. The output should consist of one line containing one value, the maximum possible total confidence of a sample. Sample input1 is exactly the same as sample input6! It appears that this is actually present in the official problem as well.